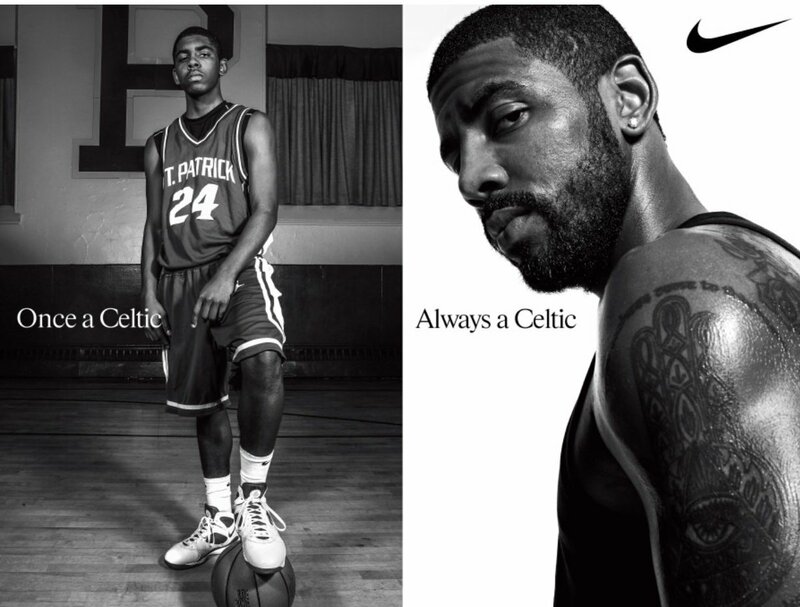 Most Boston fans don't realize Kyrie Irving was a member of the Celtics team when he was 16 years old. He played his senior year at St. Patrick High School of Elizabeth, New Jersey and the team name was The Celtics. He'd been content at Montclair Kimberley Academy, the tiny private school where he'd racked up 1,000 points over his freshman and sophomore years, leading the team to a New Jersey Prep B state title. Everybody knew the precocious point guard, the one so innovative with the ball that the faculty flocked to games to see what he would do next. "I had to show them I could play with them (St. Patrick teammates)," Irving says. "And, after a while, I had to show them I could dominate them." Sounds like our Kyrie Irving, doesn't it? Well, in the victory last night against Lebron James' Cavaliers, he demonstrated how he keeps challenging himself to get better and do whatever it takes to win. The Kenmore Square billboard seems perfect. And well-timed.